Walking is an important mode of travel in Pinellas County. Everyone is a pedestrian, and people make pedestrian trips on a daily basis, whether that means walking from the transit stop to work, walking from the parking lot to the store, or walking with children to school. Walking is also a great form of exercise. Our region places a high value on walkability and Forward Pinellas is working with local, state, and Federal government partners to ensure that walking is a safe, comfortable, and viable transportation option in Pinellas County. Prioritizing pedestrian safety, comfort and accessibility is gaining ground in public decision-making and transportation investments, both locally and nationally. 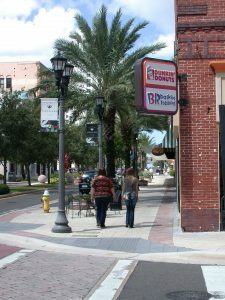 Recent jurisdictional and regional planning efforts have identified improving walkability as an important goal for Pinellas County. The U.S. Department of Transportation continues to promote better conditions for bicyclists and pedestrians. Walking is being treated more as a viable mode of transportation in its own right and as an indicator of a livable community; pedestrian improvements are no longer considered an “add-on” to roadway projects, but rather as an integral part of the transportation system. Provide an opportunity for elected leaders to support agency staff in implementing short and long term strategies. There’s a lot to look at out there. Don’t forget to watch for cars and bikes. Cross at the corner and use the crosswalk. Wear light- or brightly-colored clothing and reflective patches. Look left, right and left again before crossing. Establish eye contact with drivers and cyclists. Stay to the right on off-street paths shared with cyclists. Check the path: watch for uneven pavement, slick surfaces, curbs and ramps.